Over the last few years what I have missed the most about my writing is honesty. The idea that I could speak my mind through words. Maybe because the blog got noticed or that too many readers had a say in comments or otherwise. And when did my writing become tamed to the boundaries of its exposure, I cannot say. And this grew to be one of my biggest regrets. One that drove me to walk off this very space for almost close to a year. The jury is still out on if this break had an effect. But one can say that identifying the problem was easy with the freely available time and distance. It is an expression. Of who I could be. Of who I couldn’t be. Of polished drafts and incomplete thoughts. Of ideas that may see no end. Of stories that see new beginnings and amends. But at the end of the day I want my writing to speak who I am. Of what I believe. What I wish to believe. It is so scary to put yourself out there. For so many eyes to observe, so many minds who think. And so many advocates of free expression, who judge. Irony, anyone? I get scared when I realise that almost every second travel post looks the same to me. I get jittery to notice I haven’t quite enjoyed any book review all these years. Skeptical that some unknown food blog made more sense than the well curated content oriented video recipe embedded did. You understand my dilemma? Do you notice the chaos that is me tonight? So many voices are getting lost in their trials of getting heard. So many ideas muted to gel with the herd. All because we didn’t have the strength to tell them. “I guess you are doing it better your own way”. No it is not a rant. I know this blog has come to pass many such on countless sleepless nights. This one is simply a heart to heart chat. I ask tonight, have we over the years through our own ways to fit in, discouraged someone else from being themselves? When the button hits publish, I will go off to sleep. And do you know what thought I take with me before that? This week I will discover the blogs and bloggers in my twitter list. So many who got connected through the written word over these last few years. It feels good to be you in another person’s blog post. 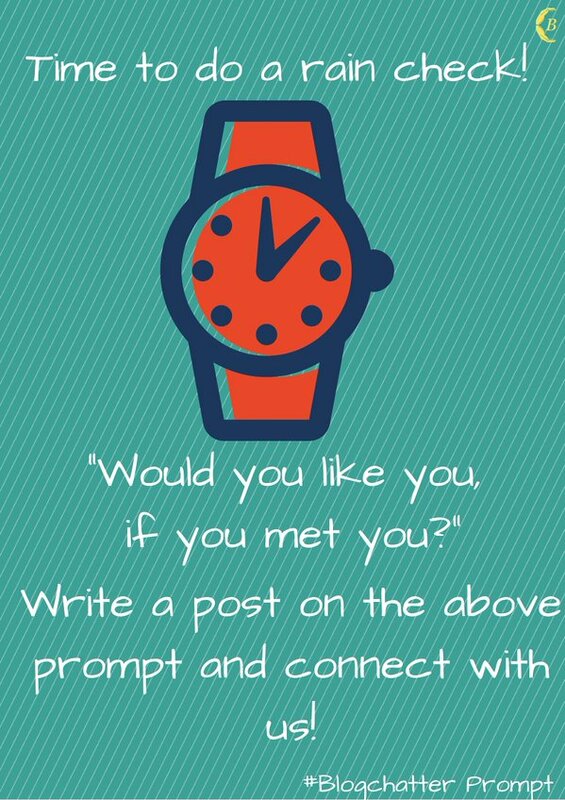 This week #Blogchatter prompt is ‘Would you like you, if you met you?’ Tell us would you appreciate the person you have come to pass in this life? Connect your post below and also read others as well. Blogchatter is a blogging community which follows a lot of good blogging practices, you may like to connect with us. And every Wednesday we meet over at twitter sharp 8.30 PM IST for a fun filled chat session on blogging related topics. Being a new blogger too, many times I have discarded many topics which I thought I will publish. Scared was i ? May be yes!! There r mny things wich I wrote to publish but they still remain as drafts. Your writings hv always hv some kind of freedom, both old and latest. I prefer your free rants. Richa , if there is one thing that your writing is -besides being so fabulous , then its coherent. While in most posts you explore various thoughts but there is always this one thing I can take away and it stays. Isnt that such a gift? I was speaking to some one about exactly this – of finding something interesting while reading other people – something new and most of the time something that mirrors our thoughts. I always find a mix of both in your space and as usual this post is a beautiful prompt to write on this week. Candid thoughts brilliantly put together! Yes I agree that I procrastinate quite a bit, before I hit publish on any post, and many times it is because I wonder, whether what felt right to me will strike a chord with the person reading it. 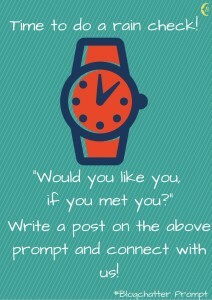 The prompt this week is again thought-provoking! That is often not bad.. but maybe on some occasions over thinking kills intrinsic ideas as well no? Richa, it’s such a honest post and would like to be me sometimes, the protagonist. But, it demands lots of guts. I can relate to this post so much. You never cease to surprise your readers. Oh Wow!!! I am so glad to have landed on your blog. Such an honest heartfelt piece of writing.Can’t wait to read all your posts. Actually this is so true for so many of us. We always tend to wonder whether whatever we write on will be liked by others or not. It’s like a constant battle between what we like vs what others may actually like. Though difficult, it’s always important to find a happy medium between the two and make the move. You never know whatever you like may actually strike a chord with your audience. And if you don’t make the move at the right time, you would only have regret.